Sweet! 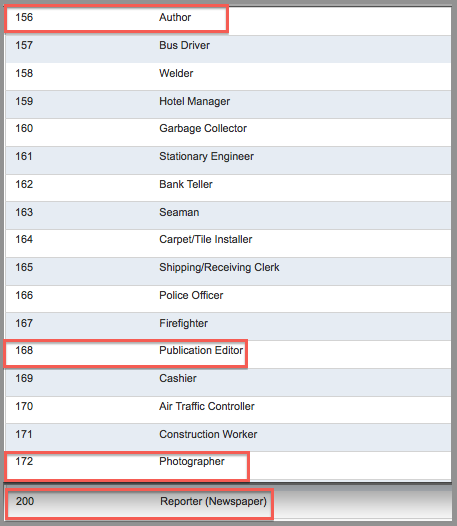 The WSJ published a 200-item list ranking the best and worst jobs of 2013. 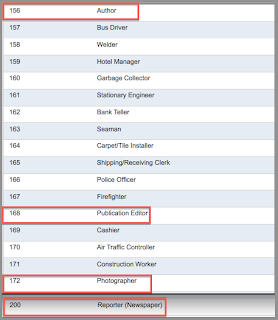 My job, editor/reporter/photographer, is a combo of the very worst, (number 200), the 172nd worst, and a splash of number 168. The good news is, if I overachieve WILDLY and get a book published, I'll leap up into the 156th spot--barely outside the bottom 25 percent. Grim. Apparently,"actuary" is the best job going. But I would set the happiness/misery liability threshold of that prediction at "poor." My mother SAID I always should have been an Actuary. I posted this, then I started to panic that 156 wasn't in the upper three quarters of 200. That is why I'm not an actuary. Carpet installers have it made!